In this indispensable collection, The New Yorker dishes up a feast of delicious writing–food and drink memoirs, short stories, tell-alls, and poems, seasoned with a generous dash of cartoons. M.F.K. Fisher pays homage to “cookery witches,” those mysterious cooks who possess “an uncanny power over food,” and Adam Gopnik asks if French cuisine is done for. There is Roald Dahl’s famous story “Taste,” in which a wine snob’s palate comes in for some unwelcome scrutiny, and Julian Barnes’s ingenious tale of a lifelong gourmand who goes on a very peculiar diet. 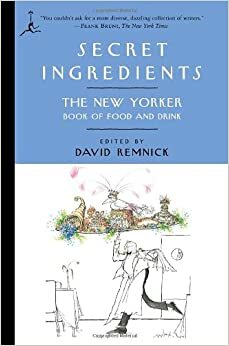 Whether you’re in the mood for snacking on humor pieces and cartoons or for savoring classic profiles of great chefs and great eaters, these offerings, from every age ofThe New Yorker’s fabled eighty-year history, are sure to satisfy every taste.